Wedding day — it’s what every girl dreams of for most of her life. Planning how grand or simple it will be and then changing the color scheme as time goes on. For 23-year-old bride Paige Kirk, the decision of peonies or lilies was not on the list. 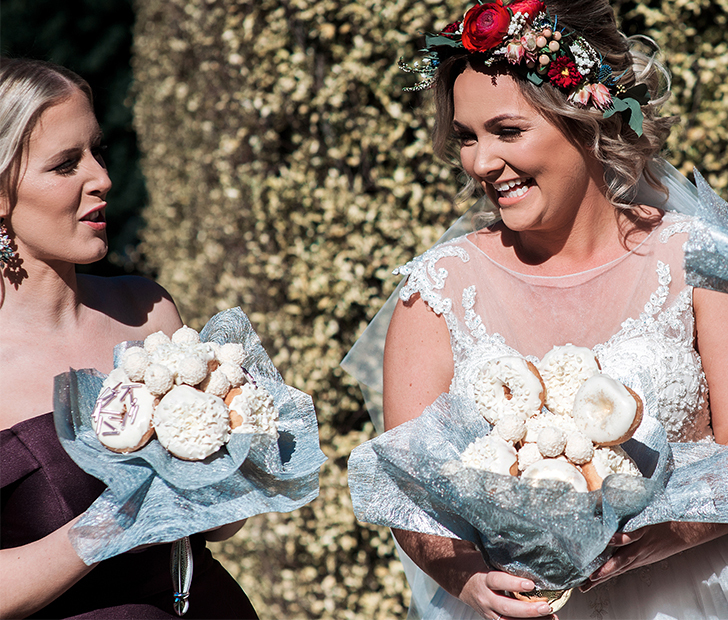 Her bouquet would consist of an elegant assortment of doughnuts. The Australia-based bride caught even her bridesmaids off guard during a pre-wedding photo. The moment was captured on video when Kirk announces they are no longer walking down the aisle with the burgundy and yellow bouquets. One of the bridesmaids can be heard off camera asking permission to indulge in the desserts. “Me and my husband, Steven, thought it would be different, fun, and lighthearted,” explained Kirk. The tasty arrangements were provided by Dessert Boxes and Kirk is the first bride to walk down the aisle with its products. In case you were curious, no, they didn’t eat the bouquets. Best of wishes for their future years and doughnuts together. Are you salivating over these bouquets? Share with your friends on FACEBOOk!